"The Courthouse stands between Main Street to the south and King Street to the north. Symbolically separating the traditions of democracy , where power resides in the hands of the people, from the traditions of authoritarian power, where the important decisions of every day life are made by those far removed. Sealed proposals will be received by the commissioners of McKean County until September 20, 1879, at two o’clock p.m. for the following work requited in the erection of the McKean County Court House, in separate tendons. 1st - All mason work from the foundation to the top of the water-table, including excisting. 2nd - All brick work above the foundation, including the netting of the cut stone. 3rd - Furnishing and cutting of all cut stone per cubic foot, in two estimates. 1st: Furbishing and cutting native stone. 2nd: Drawing from depot and cutting Ohio stone. 4th - All carpenter and joiner work. 5th - All lashing and plastering. 6th - All painting and glazing. Each bid must be accompanied with a good and sufficient total in the area of twenty-five (25) percent of the amount of the bid, as surely of acceptance and fullfilment of contract. Plans can be seen and specifications furnished at the commissioners office, Smethport Pa and the office of the supervising Architect, M.F. Beebe, cor. Main and Eagle streets, Buffalo, N.Y. The time for opening bids is hereby extended to October 7, 1879, at 2 o’clock p.m.
Judge Cleland continued: "Oil was discovered in the Bradford field in 1871, and shortly thereafter the oil boom was on in McKean County. Between 1870 and 1880 the population of the country grew from 8000 to 42,000 people. In the city of Bradford, it was said, “Where the cows roamed and tingled their bells by day and night are now handsome buildings occupied by busy men. Where one line of railroad with one train a day, drawing one dilapidated coach, then served all the needs of business, there are five railroads, each well equipped with rolling stock and running numerous trains heavy laden. Then the dozen lawyers who stayed here to obtain redress for the grievances of the people found abundance of time to prepare their briefs; now the hundred who have come with us have abundant employment, and there are not yet enough to entirely prevent the commission of crime and the doing of wrong. Then four weeks of court, giving the judge a considerable part of each day for relaxation, were ample; now, with twelve weeks of constant labor in court, business is accumulating, causes of suitors are two years behind and prisoners languish in jail waiting for their trials. Then the Sheriff and Prothonotary, without assistants, were gentlemen of leisure; now, with bevies of deputies, they are the busiest of men. Then our jail, with its twenty four cells, was frequently without enforced occupant; now it fairly groans with it thirty to fifty prisoners.” (Hamlin, quoted in Stone). In 1881 the Bradford oil field produced 23 million barrels of oil, the highest ever annual production. 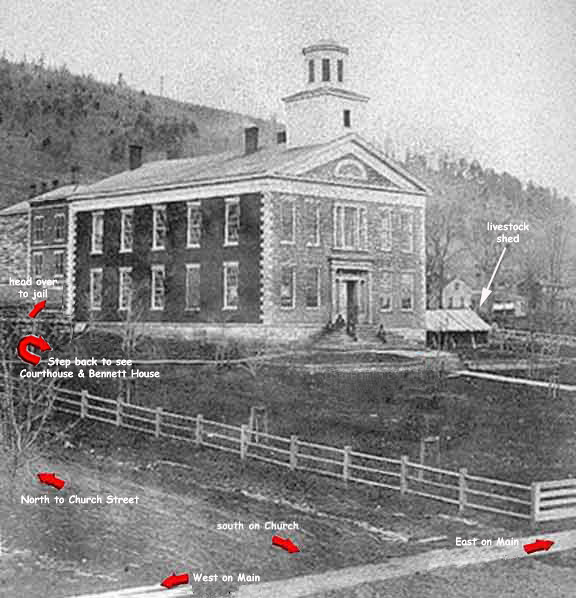 The courthouse of 1852 was clearly not suitable to meet the growing commercial demands of the new oil boom economy, although it was noted, “many of the old farmers and lumber men” mostly from the eastern part of the county, thought the old courthouse sufficient. But to the businessmen caught up in the oil boom, it was also not adequate for another reason: civic pride. It simply would not do for a world class commercial center like McKean County to have a courthouse inferior to those in surrounding counties. Enter Orlo Hamlin, who, in a remarkably candid reminiscence, recalls the efforts he spearheaded to build a new courthouse. 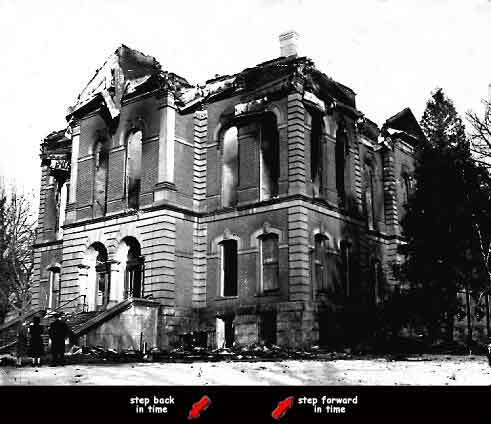 Under the law in effect in the 1870s construction of a new courthouse required the recommendation of two consecutive grand juries and the approval of the commissioners. Supporters of a new courthouse were stymied because one grand jury had recommended construction of a new courthouse, but the next grand jury recommended repairing the old one. In 1879 another grand jury recommended the construction of a new courthouse, and, as Hamlin put it, “ the friends of the undertaking thought it was then time to try again.” He garnered the support of the county's large taxpayers, including oil producer Charles S. Whitney, and landowner Gen. Thomas L. Kane. But here was a hitch. The vote in the grand jury was expected to be close, and one supporter, Charles S. Wheeler of Bradford, could not be present until the following day. Alerted to the situation, Judge Wilson postponed his charge to the jury and dismissed them for the day. Upon Wheeler's arrival, however, Judge Wilson appointed him as foreman of the grand jury. The commissioners were split on the issue of building a new courthouse: one in favor, one opposed and undecided. 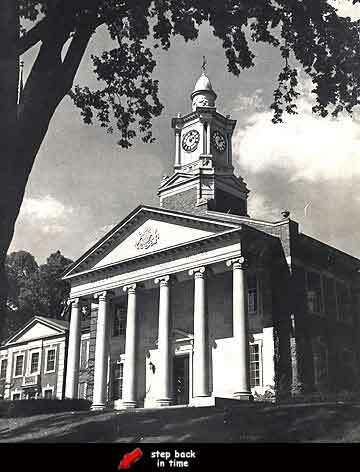 After Hamlin arranged an inspection tour through the newly constructed Warren County courthouse, however, the commissioners contracted with the same architect who built the Warren County courthouse to build the new courthouse in Smethport and the deal was done. 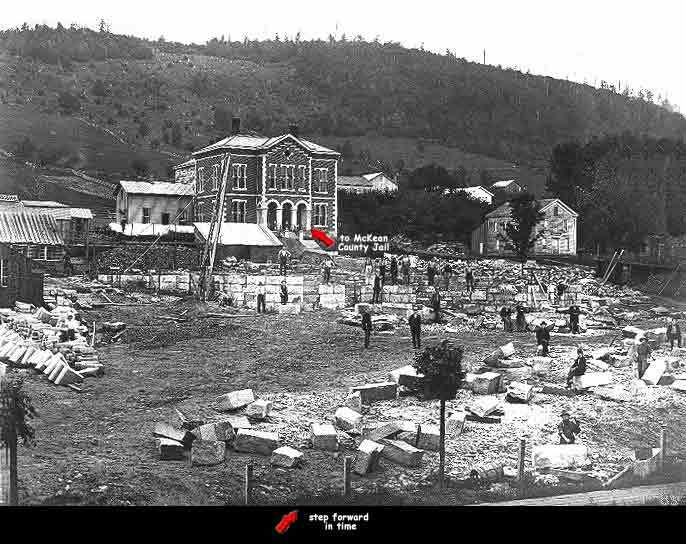 In the fall of 1880, the commissioners issued long term bonds totaling $110,000 to provide construction funding. Some contemporary sources state the building actually cost approximately $80,000. 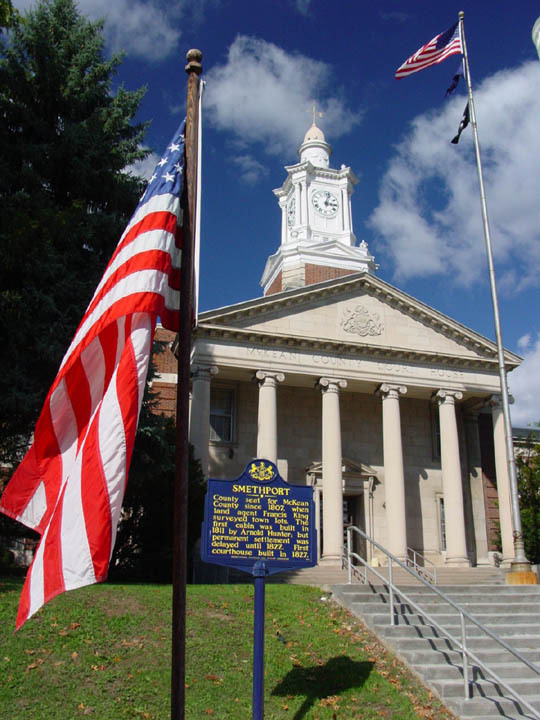 In any event, the commissioners noted with some pride that the McKean County courthouse cost less to build than the comparable Warren County courthouse which cost $125,000. The McKean County commissioners noted that, unlike the Warren County commissioners, they saved money by using imitation walnut. This third courthouse was significantly larger than the one it replaced. It was approximately 70 feet wide and 120 feet long. There was a large courtroom on the second floor, with various county offices on either side of a wide corridor on the first floor. Two wings were subsequently added: the east wing in 1914 housed the offices of recorder of deeds, judges chambers and law library; and the west wing in 1938 added in 1938 added space for the county commissioners, treasurer, superintendent of schools, district attorney, county detective, grand jury room, small courtroom, and lawyers’ room. This third McKean County courthouse was a place of some significance in the history of the law. It was in its courtroom in the last quarter of the 19th century that the law of oil and gas was developed as various disputes among promoters, surface owners, service contractors, and all the other interests associated with the oil and gas industry worked their way through the court system. This was as significant in its day as the development of the law of the internet, computer patents, and biological engineering is today. So important was the development of the legal principles of oil and gas law, and so complicated was their application, and so few were the judges that understood them, that President Judge Williams was appointed and then elected to a seat on the Pennsylvania Supreme Court in 1887, and President Judge Morrison was appointed to a seat on the Superior Court in 1902 and then elected to a full term in 1903. Atop the courthouse was statue of Lady Justice holding the scales of justice in one hand and the sword of justice in another. At least twice she witnessed men fall from her perch to their deaths. The first was Charles Wahl, a painter. In 1893 he was hired to paint the galvanized iron on the courthouse exterior including the tower. He had completed the uppermost part and was removing the scaffolding. 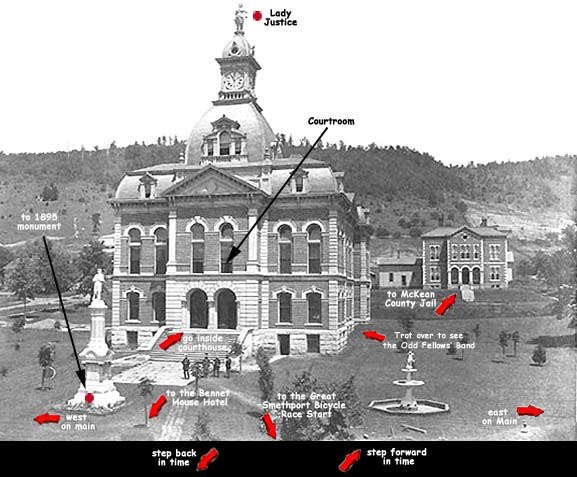 Standing by the cornice of the clock tower, Wahl made what the McKean County Miner called, in classic understatement, a “fatal misstep.” He fell down the front of the courthouse to the ground below. He never regained consciousness and died the next morning. Read more on Harry Ryan's fall in the article below. Smethport, Thursday, Aug. 22, 1907. Harry Ryan, better known as "Reddy", met his death at 2:35 o'clock Monday afternoon by falling from the shoulds of the "Goddess of Justice" on top of the court house, to the ground, a distance of 180 feet. The unfortuante man and "Jack" Boelton had been around town together during the early part of the day and finally they got discussing their ability as "Steeple Jacks." "Reddy" said that he could climb up and kiss the "Goddess" without aid of rope or staying, and started to prove it. Boelton following him soon after in an attempt to prevent him from carrying out his rash threat. Those who saw him make the start did not take him seriously because the door leading into the cover is usually locked and they know the janitor would not give him the key. But it just happened that the door was not locked and in a short time people on Main street saw Ryan come out of the top window on the east side and climb up to the steep roof to the pedestal on which the "Goddess" stands, and pretty soon Boelton shoved his head out of the window from which his companion had come, but he did not venture any farther. Ryan took quite a long rest on the pedestal and the spectators thought he would not venture father, but pretty soon he attempted to continue his perilous ascent.The "Goddess" is fouteen feet in height and he made several unsuccessful attempts to complete the tasks. Finally he got a foothold on some of the folds in her iron draperies and raised himself until he got his arms around her waist and from there it seemed easy to reach her shoulders. He first placed his legs around her neck. He looked into her face and apparently kissed her and then made some remarks about her being pretty good looking to the anxious spectators below. He finally started to made the descent and had just let himself down her back and let go of her shoulders with one of his hands when his other hand slipped. He made a frantic effort to catch himself but it was too late and he came crashing down to the ground; strinking the cornish over the clock on the roof of the tower and the rood of the entrance, finally landing on the ground on the west side of the steps facing the Miner Office, not more than ten feet from Janitor Bush who was mowing the lawn at the time. Many were watching him make the perilous trip and in an instant a hundred people were gathered around his lifeless remains. Dr. Ostrander was among the first on the scene and straightened him out on his back and made a hasty examination. But it only took a glance to see that he was past all earthly trouble for his head was terribly cut, his skull crushed and his brains lying a few feet from his body in the grass. The writer was among those who witnessed the terrible scene and many would turn their heads away as he would move about in his perilous position but still they could not keep their eyes off from him. Nearly everyone seemed to have a premanition that he would fall and many remarked that he would never come down alive. Just before he started to come down someone remarked that the descent was the most dangerous and in another minute he was flying through the air. We leearn that the door had been left open to give janitors who had been working on the inside of the tower access to their work. Harry Ryan was about 34 years old and is survived by a wife and five children, the eldest of whom is about 18 years of age, who reside on Hilton Avenue, near the Smethport Window Glass factory. He also has one brother and one sister living in New Castle. He was born in New Castle and was a glass blower by trade. He has worked here for about five years and was a memeber of the glass workers fraternity in which he carried an insurance of $600 on his life. Coroner Hall was notified but decided that an inquest was unnecessary and under the direction of the members of the above fraternity his body was taken in charge of Undertaker Sasse and prepared for burial. His remains were taken to New Castle yesturday and the funeral will be helf at that place today, under the auspices of the Window Glass Workers association.